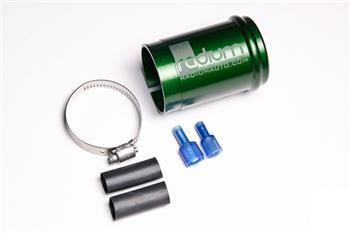 Radium Fuel Pump Install Kit - Dezod Motorsports Inc - Home of the automotive performance enthusiast since 2002. For those looking to increase the power output of their vehicle, this plug and play (bolt-in) fuel pump solution uses the most popular high performance 39mm diameter fuel pumps currently available on the market. This kit features a 6061-T6 CNC billet aluminum sleeve that slides over the corresponding 39mm pump to mimic the larger 43mm diameter BMW fuel pump. The machined “rib” locks and properly locates the filter sock in the BMW hanger assembly. The sleeve includes a laser etched logo. For protection, the sleeve is then anodized in order to resist alcohol (E85, ethanol, methanol) corrosion. If you supply your own pump, measure the outside diameter of the pump body to ensure it is correct before ordering. The sleeve is designed for pumps with a 39mm diameter. If your pump is greater or less than 39mm, this sleeve may not work. Also included are the necessary electrical components to make the kit plug and play (no cutting, drilling, grinding required). NOTES: The Walbro F90000262 Gas pump kit does not include an adapter wiring harness because the factory BMW wiring has same connectors as the Walbro pump.